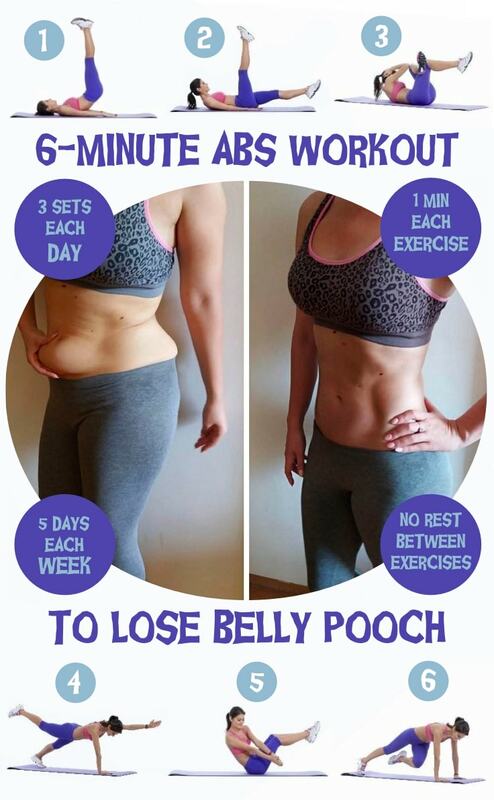 I know you want to miraculously get rid of the fatty layer that covers your abs. But the truth is, in order to lose belly pooch and trim your waist, you need to sweat your way out of it. There is only one realistic way to lose belly pooch: by sticking to a proper workout regimen and following a healthy diet plan. The 6-Minute Abs Workout is the best way to lose belly pooch and build up stronger core muscles. It also improves body posture, reduces back pain, and keeps the entire body balanced. Do this exercise for one minute straight, then jump right to the next one. While moving your legs up and down, focus on your abdominal muscles and try to engage them with every move. Do scissors for one minute. Touch your left knee with your right elbow for 30 seconds, then switch sides and touch your right knee with your left elbow for another 30 seconds. Hold into a diagonal plank position for 30 seconds, supporting your body with the right hand and left foot. Switch hands and feet and continue for another 30 seconds. Do Russian twists for one minute straight. Perform this exercise for one minute, then the first set of your abs workout is done. For best results, it is recommended to do at least 3 sets per day, 5 days a week. Have fun! How would you like to burn belly fat quickly and easily? Here are 5 incredibly powerful fat loss tips that are sure to melt away that irritating tummy fat once and for all! One way to help yourself burn away fat like crazy is to stop eating the same food each day. This is better known as shifting calories. When you shift calories, you are preventing your metabolism from reaching a comfort zone. This is because your body becomes acclimated to your daily eating habits. By constantly switching around the types of nutrients you are consuming and the amount of calories you are eating, you will prevent your metabolism from becoming acclimated. This all will keep it running as high as possible, and this certainly help you continuously burn fat like crazy! Similar to eating the same every day, if you exercise the same way too much, your body will also get used to this as well. You will then end up with what’s known as a plateau. In other words, you will be doing your usual exercise routines, but the weight and fat hasn’t moved! So, what I recommend for you to do is to consistently change-up your exercise routines to prevent a plateau. I know you may have heard this many different times, but it deserves to be repeated again. Drinking a lot of water will do so many wonderful things for you in regards to burning off fat. It will help keep your metabolism running strong; it will remove dangerous toxins in your body, and so much more. By having something such as a protein shake or another high protein food with every meal you eat, you will successfully prevent binge eating. Not only you’ll feel more satisfied with every meal, but you will also enable your body to burn fat off lightning fast. The reason why is because eating plenty of protein causes your body to burn calories in order to digest it! Free radicals are toxins that are in your body from many different things (the environment, the food you eat, etc.). These things are not just dangerous for your overall health, they are also a huge reason for causing many people to become fat. And eating plenty of foods high in antioxidants. Is it that time of year where you once again are thinking that it’s time to lose that belly fat? Has your partner now got more to hold onto when it comes to your love handles? Have you tried to lose belly pooch on the latest fad diet that promised to help you with a magic pill? Do you remember that infomercial gadget that showed a gorgeous looking model with ripped abs using a fitness machine claiming you can shrink your stomach too with just 5 minutes of using the machine a day? Seriously!? When you get down to it there are two key principles you need to lose belly pooch and change your life forever. The key here is to stimulate fat-loss around your stomach. You should know that spot-reduction DOESN’T work. Despite your best efforts you will not see ripped abs by spending time doing endless repetitions of crunches, leg lifts, and torso twists. Abdominal exercises will certainly help strengthen your core and assist with maintaining a healthy back. But achieving an overall loss of body fat is best done by focusing on exercises that work the largest muscle groups like the legs, chest and back. You may ask why these exercises? It’s simple. Exercises that focus on large muscle groups increase your metabolic rate. This means you’ll burn energy at a greater rate both during the exercises and for the 1 to 2 days after it. As an added bonus, the exercises increase the fat-burning hormones within your body. Secret 1 – Large Muscle Group Exercises will really help you lose belly pooch for good. 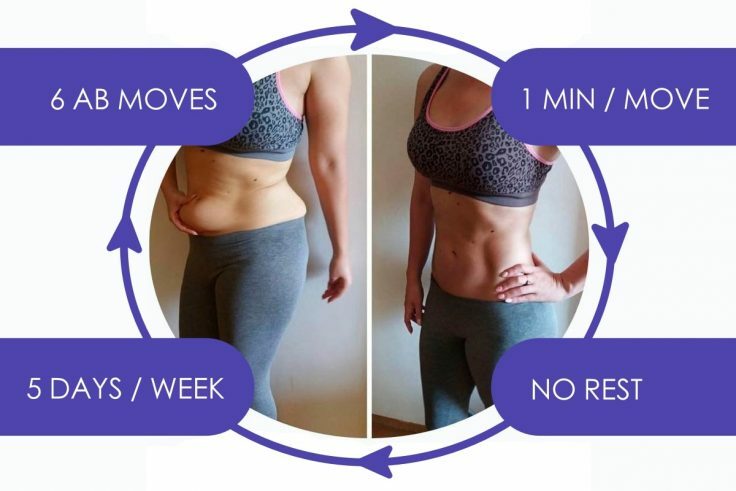 NEWS FLASH… Fad diets usually work against your body to lose belly pooch!!! A little biology lesson for you. If you restrict your intake of one or more of the macro-nutrients (proteins, carbohydrates or fat) most of the time you will actually lose lean muscle (the good weight you want to keep) and lower your metabolic rate. You’ll also affect your body’s hormonal balance; affecting the processes for regulating your insulin and blood sugar levels will make your fat loss cease. A lower metabolic rate combined with hormonal imbalance = FAT LOSS STOPS! You should aim to follow a diet containing varied foods obtained from natural sources. You should also include proteins, carbohydrates and fats. Your body will appreciate the vitamins, minerals, antioxidants and enzymes it needs to burn fat and help you lose belly pooch. Secret 2 – Ensure your diet contains healthy foods, rich in macro nutrients to maximize your body’s fat-burning engine.